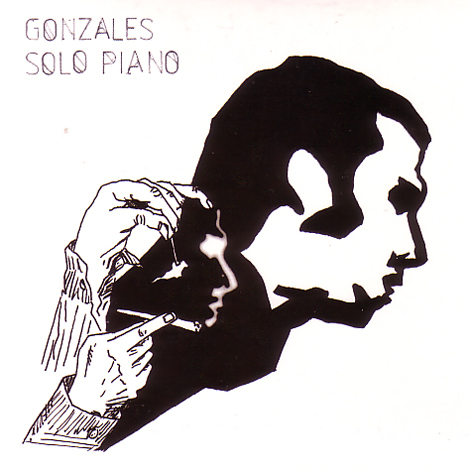 A good friend mentioned to me over the summer that he had listened to a promo of the forthcoming Gonzales album and couldn't quite believe what he was listening to. An album of delicate solo piano pieces, written and played by the notoriously extravagant berlin resident with flamboyant b-boy aspirations. Well, it didn't seem very likely, or at least it was hard to imagine that it would be anything more than a mildly touching novelty item. As it turned out it's an assumption that couldn't be more wrong. "Solo Piano" is in the top 5 albums of the year for me, a quite incredible collection of the most moving, accomplished and unforgettable solo piano pieces you'll hear in a long time, and one of the most tantalising career moves you could possibly imagine. It's true that piano music has seen something of a rebirth over the last couple of years, but what really gets me with this album is just how simple and timeless the compositions here are. Having heard this album no more than 5 or 6 times, each track is now deeply embedded in my mind - I cant think of anything else released this year that touches its majestic simplicity and unstained beauty. Released by the No Format collective - it's been a long and rather lagborious process to get hold of this album in good quantity and at a reasonable price (thanks to all involved!) - but sometimes we hear a record that compells us to do the oddest things, I tell ya. "Solo Piano" is just one of those albums that rides the zeitgeist to oblivion, transcending fashion and trend, keeping itself close to your heart at all times. If I'm not listening to this magnificent album in 5, 10 or 20 years time I'd be very surprised indeed. A huge recommendation - every home needs a copy.